This looks like one to put in the diary. “Romantic Ireland’s dead and gone” W.B.Yeats. September 1913. As an immigrant to Australia, O'Toole is concerned with the repositioning of Irish Identity in a post modern culture and with issues of negotiating individual identity; the reality of migration; a sense of place and displacement of language and community. Her artwork is an emotive response to immigration and the inquiry into the (pre)conceptions of Ireland and ‘Irishness’. “Blue bottles, in the Irish imagination, are alien to us. They exist only in exotic places / spaces. They are exquisite in their visual beauty but you can’t touch them. They drift aimlessly, unrooted, uncertain, grouping; gazing in different directions so in case of danger, some can survive. Blue Bottles are not a single organism, but made up of a number of zooids. Each zooid has a specific role and together they function as if it were an animal. These little beings remind me that we all need a safe place/space, physically, spiritually and emotionally. As an immigrant to Australia, I am establishing new beginnings. The distance both physically and psychologically between the two countries allows me to take “a look at us as Irish people, our displacement, our living all over the world, our history of emigration, our psyche” (Alanna O Kelly). ‘My intention is not fashion sentimentality of a homeland’. (John Moriarty 2007) but to express the private and collective basic emotions common to all immigrants and express my perception of Ireland today. The poem, September 1913 by W.B.Yeats, is a response to the Lockout of September 1913 in Dublin. Yeats was infuriated by the man who led the lockout, W. M. Martin as he also refused to support Yeats ambition of buying an art gallery in Dublin. Yeats comment in this poem, on the justification of the pursuit of money and the lack of idealism in Ireland is reminiscent of Ireland today. Many people in Ireland believe the growing consumerism is destroying Ireland’s culture. Our new economy has created such wealth and affluence that it has desensitized its people. We have, in my opinion, to a large extent, become superficial and depersonalized. Ireland of old, an enclosed, inward looking and conservative country still lies in the underbelly of Irish society. ‘Romantic Ireland is dead and gone’. Dialogues: Women from Ireland. Katy Deepwell. Published by IB Tauris & Co LTD. P140. Dialogue: RTE 1. Radio. ‘A tribute to John Moriarty, writer and philosopher, who died at the beginning of June.’ 7th July, 2007. 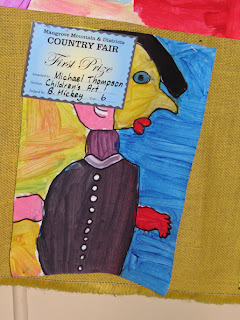 Final art post from the Country Fair. Youngest entrant (18 months) wins $2 First Prize in Pre-School Children's "Other" category. Photography and arrangement (fridge magnet backing on 'calf cradle ' panel) by Claire Berecry-Brown. Claire considers how to spend the cash. 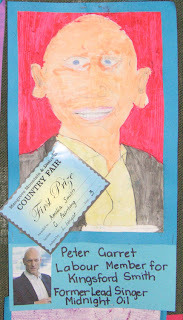 A preview of art at tomorrows Mangrove Mountain Country Fair. Well done Michael Thompson of Somersby School - too bad about the prize. On the subject of winners and others. 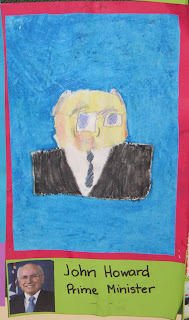 Are the portraits by children at Central Mangrove School an indication of things to come ? Continuing The Back Page practice of canvassing candidate's arts policies at election time, the following letter has been sent to candidates standing for Robertson. I would like to invite you to outline, for the arts community in the Robertson Electorate, your arts and culture policy for the upcoming federal election. This initiate was well received and we have been asked to do the same for the federal election. We are interested in the overall party policy, but particularly keen to hear your comments with regard to policy in terms of local needs and priorities for art and culture. This invitation to candidates will be posted on the website. Responses will be posted as soon as they are received. Visits to backpagefree.blogspot.com have been steadily increasing over the last year, but peaked during the state election this year. Your attention to this invitation will be greatly appreciated, not only because the policies are important, but also because the courtesy shown by responding both builds a sense of community and a feeling for a candidates receptiveness to his/her constituents. Thank you, and best wishes for the campaign. In view of the recent IPR debates, we note the post on the Gosford Times blog about American artist Rachel Berwick who taught parrots a lost language, and wonder if a breach of copyright is possible when the means of reproduction is a living organism. Information received about an exhibition (cancelled). "Agency presents quasi-things. Quasi-things fall just inside or outside a category, they move from one category to another or they don't belong to any category at all... In short, things that witness hesitation in terms of classification. On the occasion of the exhibition series "Faire un effort" of NICC at the Centre for Fine Arts Brussels, agency presents quasi-things that are related to conflicts concerning authorship. Some of these conflicts lead to a lawsuit. As opposed to visitors of an art centre, who usually approach things in a subjective way, a judge is expected to make an objective judgement. For the purpose of evaluating copyright, a judge employs the division between categories such as nature and culture, evolution and creation, object and subject, collective versus individual... Many things are difficult to classify as such. Take for example Specimen 770. 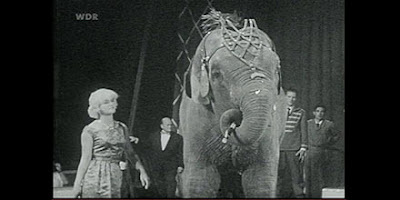 This quasi-thing is part of the German TV film “Zwischen Zirkuskuppel und Manege” that was broadcasted by WRD in 1964 (see picture above). The point of conflict is the copyright of a dance of a circus elephant. The judge has to decide whether the film abused the copyright of this dance. The resulting discussion during the lawsuit questions whether the taming of an elephant can be protected by copyright of dance." 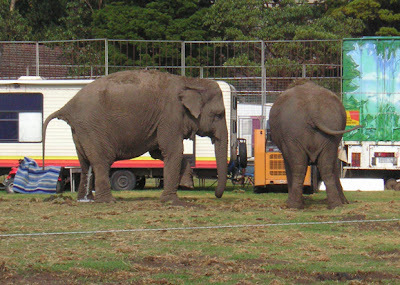 Elephants in Gosford, 12th October. Left front foot held in raised position while peeing © Nelli. Just in passing – a note on art and/or culture provoked by Poli-talk on such matters in election 2007 policy announcements. An extract from Between a Rock and a Hard Place – the Possibilities for Contemporary Art Institutions to Function as Critical Political Spaces. Part of the Public Preparation series for the upcoming Biennale of Young Artists in Estonia, and a document that will form the basis for discussion at Market Gallery in collaboration with variant magazine. See also “I reach for my…” tagged posts on Back Page. Back Page posts this message for those who want to act in response to recent events. Burma's generals have brought their brutal iron hand down on peaceful monks and protesters -- but in response, a massive global outcry is gathering pace. 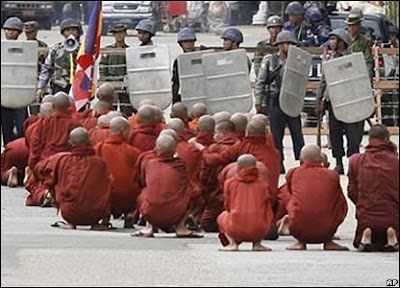 The roar of global public opinion is being heard in hundreds of protests outside Chinese and Burmese embassies, people round the world wearing the monks' color red, and on the internet-- where our petition has exploded to over 200,000 signers in just 72 hours. The pressure is working - already, there are signs of splits in the Burmese Army, as some soldiers refuse to attack their own people. The brutal top General, Than Shwe, has reportedly moved his family out of the country – he must fear his rule may crumble. The Burmese people are showing incredible courage in the face of horror. We're broadcasting updates on our effort over the radio into Burma itself – telling the people that growing numbers of us stand with them. Let's do everything we can to help them – we have hours, not days, to do it. Please sign the petition and forward this email to at least 20 friends right now. Scroll down our petition page for details of times and events to join in the massive wave of demonstrations happening around the world at Burmese and Chinese embassies. Continuing the practice started with the State election, Back Page will be covering the arts policies of the major parties and other relevant political organizations in the upcoming Federal election, with a particular focus on local candidates. We begin with the Labor Party’s Policy and commentary on it by NAVA in their Media Release. Today the National Association for the Visual Arts (NAVA) expressed its positive expectations of Labor’s New Directions for the Arts policy, launched last Friday. Full text of the statement is available at NAVA web site, which also has a link to the full text of New Directions for the Arts. The document, despite employing the planners favourite term “Vibrant” on its cover, a word made almost meaningless through overuse, does contain some interesting policy and useful perspectives. Like Coalition rhetoric in the past, it makes a point of pushing for greater private sector investment and corporate philanthropy in the arts. This is of course easier said than achievable in the current cultural climate in Australia, and of course the Big End of Town is attracted to larger arts institutions and prestige events. We look with interest for measures to support small to medium scale art projects. There is also a question over the future of AbaF (Australian Business Arts Foundation) under the Labor policy. It is good to see, in the section 'Supporting Australian Artists', that there is recognition of “the arts as a significant field of endeavour, worthy of support in their own right”, as well as the arts having a purpose in shaping national identity through art production and the arts sector giving “an immeasurable, sustaining dimension to the life of the nation”. Labor will develop ArtStart programs to assist young and emerging artists, and to harmonise current Australia Council, Centrelink and ATO rules for income earned by artists on welfare. This is welcome, but the commitment to “CONSIDER” adding “‘participation in arts projects’ to the criteria for employment and community participation in work for the dole programs where it is likely that such participation will improve a persons prospects of gaining employment or private income”, sounds like a “non-core promise”. Without the contribution of unpaid work in the arts sector, the artist-directed and run initiatives that nurture contemporary practice, and hence the whole food chain, would die. Therefore it would be a positive move to support, rather than “consider” this addition. It makes a commitment to examine ways to develop regional arts, and to work with other levels of government to identify local priorities. For Gosford and the Central Coast this sounds promising, but the area’s status (not really regional, rural or outer suburban) continues to confound programs of support, even when expressed in such general terms as in the Labor policy. 'Arts Education Policy' section of the policy is good in recognising the importance for individuals of arts education beyond the curriculum categories, and of its instrumental value, but does not mention the intrinsic values of engendering the expansion of cognitive faculties and the “technique” of art as a way of knowing. The strategy of encouraging “artist in residency” programs in schools and universities is useful. The topic of “Creative Industries” gets considerable attention. There is recognition, at last, of the importance of this sector of the Australian economy in the global mesh, and makes clear that Labor realises that there is a lot to do to catch up internationally. In the policy document there remains the usual blurring of the important differences between cultural entrepreneurship, creative industry and art (there are many who think that art is in opposition to the intentions of the others). But to the extent that the Creative Industry argument feeds art funding, it should be welcomed. In conclusion, New Directions for the Arts, contains many welcome initiatives, and is worth reading more closely. It also has the sense of in insider’s understanding, so one can assume it was well researched in consultation with art industry folks. Everyone will discover some shortcomings for themselves, as I did, so we look forward to Policy statements by other parties for comparison. BACK PAGE WILL BE CONTACTING LOCAL CANDIDATES FOR A STATEMENT ON ARTS POLICY IN RELATION TO THEIR ELECTORATE.